The FBI released new homicide data yesterday showing the US nationwide homicide rate increased to 4.9 per 100,000. That's up from 2014's rate of 4.4 per 100,000. Nevertheless, the US homicide rate remains near a 50 year low, and 2015's rate is comparable to homicide rates found during the late 1950s when the US was in the midst of a historical lull in homicide rates. 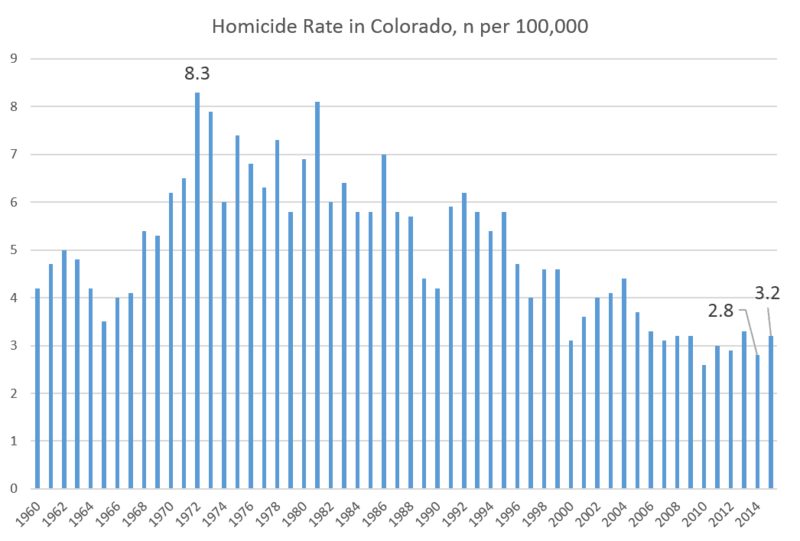 In 2015, the Colorado homicide rate increased to 3.2 per 100,000, up from 2014's rate of 2.8 percent. 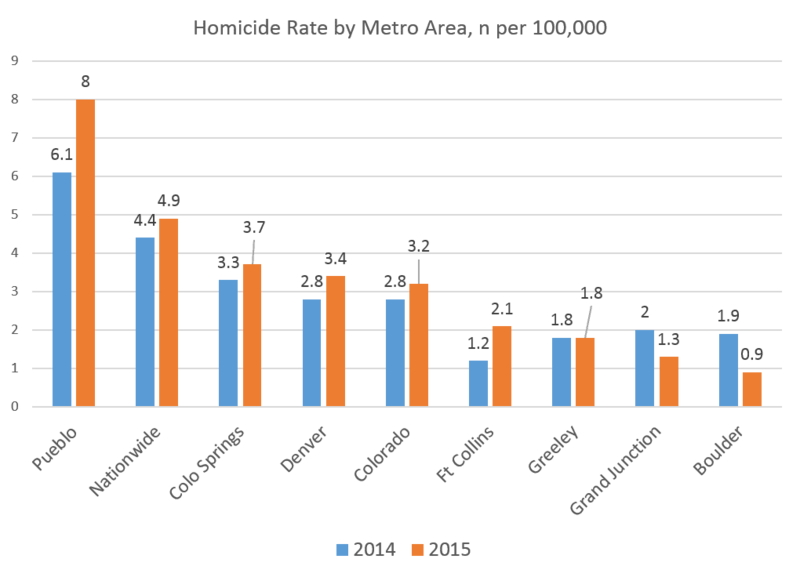 However, 2015's homicide rate is what in no way unusual compared to the last decade of data. These totals are among some of the lowest we've seen in decades. 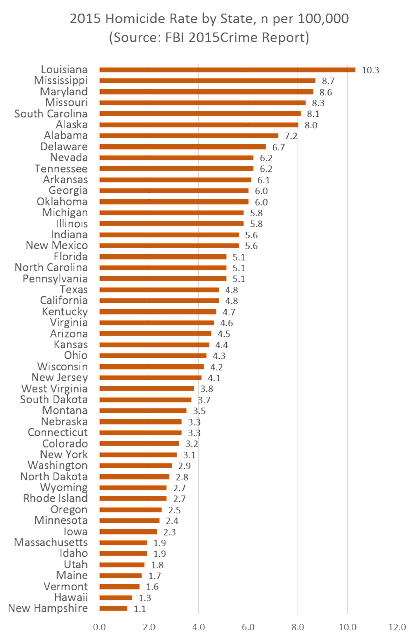 We see little to suggest that the legalization of recreational cannabis use has led to any sizable increase in homicides, or that gun control measures in recent years have had any impact that is measurable. 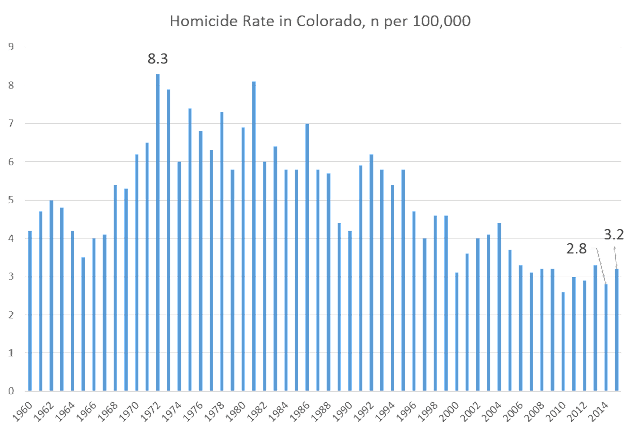 Colorado's homicide rate increased 14 percent from 2014 to 2015, compared to a ten percent increase for the nation overall during the same period. As The New York Times and New York magazine recently reported, the nationwide increase in homicides was largely driven by increases in violence in seven large cities nationwide. Denver was not among them. Homicides increased in Pueblo, Colorado Springs, Denver, and Fort Collins. The rate in Greeley was unchanged. Homicides decreased over the year in Grand Junction and Boulder. Colorado overall remains remarkably safe in terms of homicides. 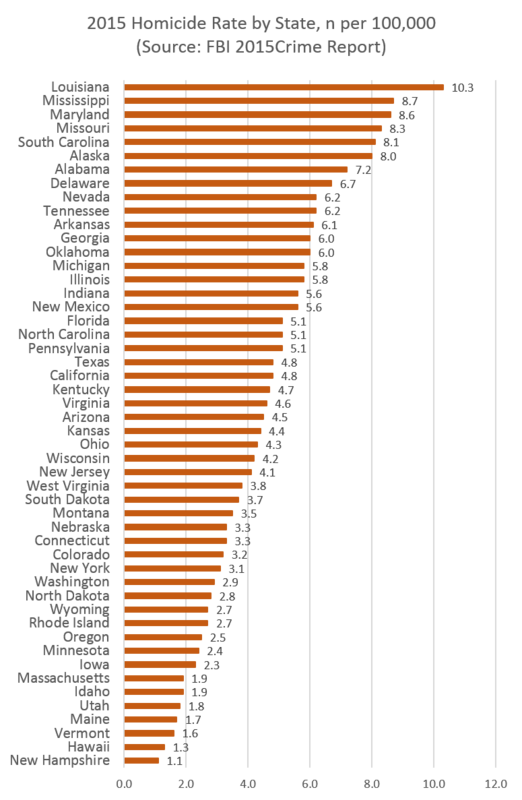 With homicide rates around 2 per 100,000, northern Colorado and Western Colorado are among the safest places on earth. Pueblo's rising homicide rates have been blamed on increasing gang activity. Statewide in 2015, there were 176 recorded cases of "murder and nonnegligent manslaughter." That's up from 151 cases in 2014. Of those 176 in Colorado, 108 were reported in the Denver metro area (with 53 in the city of Denver itself). 26 were reported in Colorado Springs and 13 in Pueblo. Pueblo's homicide rate is much higher, of course, because its population is considerably smaller than that of Colorado Springs or metro Denver. In areas outside of Metro Denver, we're generally dealing with small numbers. Pueblo's total homicides increased 30 percent from 2014 to 2015, but that's an increase from 10 to 13 over the period. This hardly indicates an established trend toward an epidemic of violence. Nevertheless, one would prefer to see movement in the opposite direction.